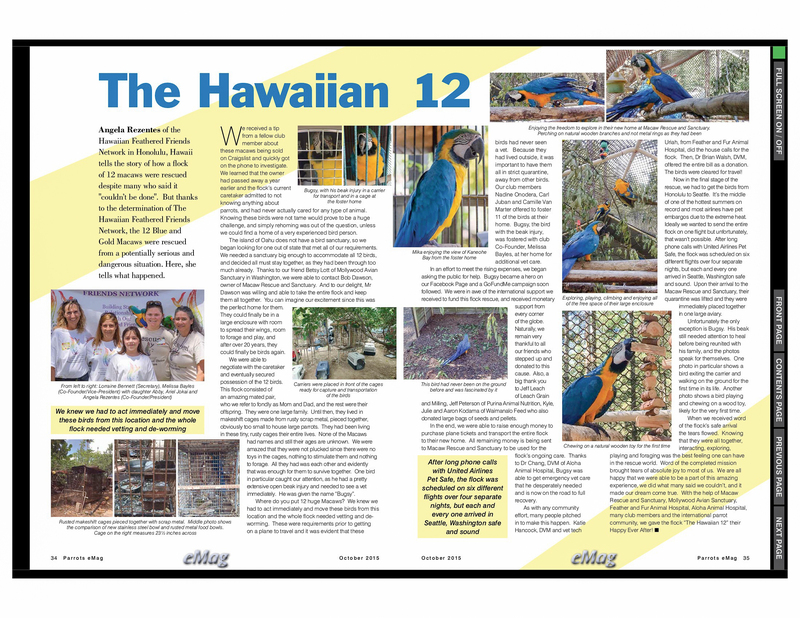 Hawaiian Feathered Friends Network began as a group of friends in November 2013. We formally became a corporation in April 2014. Our main focus areas are education, support and rescuing birds in need. Since our formation we have been steadily growing. Our members range in ages and level of experience. Our flock ranges from cockatiels through to Macaws. There is no bird too big or too small as we enjoy them all. Anyone who has an interest in birds is welcome to attend meetings for fellowship and good food. We meet once a month which is usually on the 3rd Sunday of the month unless we have an event to attend. Our meetings are Potluck so you can bring your favorite food dish to share. Most importantly, membership is “FREE” so that anyone from any background, young or old can be part of our club. Members enjoy a 10% discount at 5 local pet stores. Membership is “FREE” so that anyone from any background, young or old can be part of our club. Members enjoy a 10% discount at 5 local pet stores. If you would like more information or would like to join, please contact us at hwnfeatheredfriends@gmail.com. Meeting dates are also posted at least a week prior on our Facebook page. Membership is “FREE” so that anyone from any background, young or old can be part of our club. Members enjoy a 10% discount at 5 local pet stores on Oahu. You can sign up for membership either at a meeting or via email at hwnfeatheredfriends@gmail.com or visit us on Facebook. You will be issued a membership card so that you can enjoy the club discount at the 5 local pet stores. Come join the fun with Hawaii’s best bird club!